Matt taking the classroom outside, teaching by song. The Ripple Effect Aquatic Learning (REAL) program provides a hands-on, place-based, real-life application to school subjects while instilling stewardship to local landscape and culture among students. REAL aligns with Montana Science Standards. In 35 weekly lessons the program includes activities such as tying flies to imitate macro-invertebrates found in local waters, learning about invasive species and how to reduce their spread, discussions with local scientists to improve local biology knowledge, learning to test water quality, and much more. 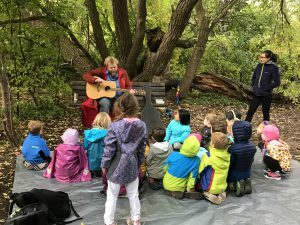 The program takes a hands-on approach through which students gain appreciation of and a deep connection to the local environment. This program partners with a variety of community leaders including those from state and federal agencies, conservation non-profits, educators and parents. REAL – connecting kids to their local environment and science! To learn more about the program or adopt it in your classroom, contact our Education Director at matt@stopais.org.